Whether it’s Barack Obama, Hillary Clinton or John McCain, the next president is going to inherit no shortage of difficult choices on the international scene. He or she will come into office with conflicts in Iraq and Afghanistan, the threat of terrorism and an ongoing genocide in Darfur to contend with – and will have to do so with polls showing public opinion toward the United States at an all-time low worldwide. These days, Albright is a professor of diplomacy at Georgetown University, serves on the board of the Council on Foreign Relations and has been campaigning on behalf of Hillary Clinton. She’s also the author of the recent book Memo to the President Elect: How We Can Restore America’s Reputation and Leadership. She spoke with World Jewish Digest about her advice for the next president on a number of foreign-policy fronts. World Jewish Digest (WJD): The biggest international crisis the next president will inherit is probably Iraq. At this point, what can a new administration do to keep the situation there from further deteriorating? 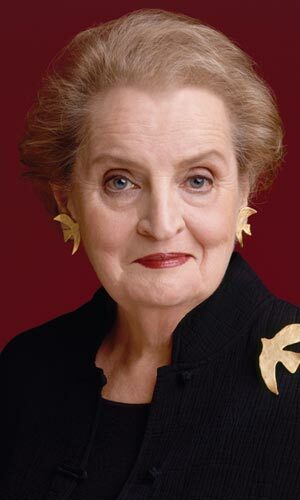 Madeleine Albright (MA): First of all, there are no good options in Iraq. That’s the tragedy. Lives have been lost and promises made, and there are no good choices. I think what has to happen is the United States has to come out in a responsible way. It is not a secret that I’ve been a supporter of Hillary Clinton, and I support her approach. She used to say ‘if ‘ the war isn’t over by the time she would become president – but now it’s clear it won’t be over. She has said she would summon her military and national security people, and within 60 days begin withdrawing forces from Iraq in a systematic, responsible way. She has not put a specific date on the end of it, which I think is significant. And she’s advocated leaving a number of forces there to deal with al Qaeda and protect Americans there. So I think that’s the most responsible thing, which is to say, ‘We have to come out, there has to be an end of this war and we don’t want permanent bases there.’ But at the same time, saying it will be done in a way that avoids as much chaos and vacuum creating as possible. The essential point is Iraq does not have a military end to it. It has to have a political solution, which means more work in terms of domestic political activities and reconstruction. There was a statement made by the Iraqi defense minister a few months ago that just put chills through my body, when he talked about our troops having to stay until 2018 because of the porous [nature] of the borders to foreign fighters and weapons. That means there has to be some kind of regional diplomatic approach to this, and it’s that combination that I think is the best hope. I think other countries need to be made to see that this is affecting their national interest as much as ours, that they need to help in training the Iraqis and sharing in the reconstruction. They have to see that, however this war started, it can’t remain an American problem and has to be an international problem. I have said that I’m afraid Iraq will go down as the greatest foreign-policy disaster in American history, meaning I think it is worse than Vietnam. Not in terms of the number of Americans or Vietnamese who died, but in terms of the unintended consequences. WJD: Looking at Iran, we’ve seen conflicting reports about its nuclear ambitions, and the administration is taking a hard line. How does the next president avoid repeating the mistakes of Iraq when it comes to Iran? MA: At this stage, it looks like Iran is the country that has gained the most out of what’s going on in Iraq – [especially] with their mucking around in Iraq itself, their physical supplying of IEDs [improvised explosive devices] and other weapons, their influence on the political system and their growing stature. But I think one of the problems here is we have very little contact with Iran, which is why there has to be a dialogue, an opening of channels of communication without the idea that just talking to them is somehow appeasing them. It’s a way to find out what’s going on because, as you point out, we didn’t have the right intelligence going into Iraq. I have to tell you, I was in Israel at the time the new [National Intelligence Estimate] came out in December, and clearly there were many disputes at the highest levels there in terms of what that NIE said. So I think we have to do as much work as we can with friendly intelligence agencies to try to figure out what is actually going on. To not have preconceptions rule policy, but to really try to get as much combined intelligence as we possibly can. WJD: One of your first major assignments as secretary of state was working on the peace process in Israel, and in recent months, the Bush administration has started to re-engage in negotiations there. How would you gauge the administration’s progress on that front and what should the next president learn from it? MA: In my book, I talk about how difficult these negotiations are but that they need to take place and the U.S. needs to take an active role. It can be a little like a merry-go-round, but it’s worth getting on it because it’s better for everyone if we are involved in talking to the parties and trying to bring them together. I personally believe it took this administration too long to get involved. They talk about the ‘road map,’ but I like to say it’s only recently they took it out of the glove compartment. It really hasn’t been actively worked on. I was in Israel right after Annapolis, and there really was a sense of hope and of gratitude to President Bush for having brought the parties together. I’d gone to Ramallah also and had similar feedback from Mahmoud Abbas on that. But I think there are now general questions about how that’s being followed and how the pledges that came out of the conference are being fulfilled. I hope very much there is some breakthrough, and I know whoever becomes president – on the Democratic side certainly – would be more than eager to carry out any kind of agreement that comes to pass in the final months of President Bush’s term. WJD: From your own experiences negotiating in the peace process, what principles that were productive in the past should guide future discussions? MA: I happen to think the parameters President Clinton put down at the end of his term contain all the elements of what is ultimately needed. There has to be a secure Israel; people can’t be expected to live without the security of their borders and sense that they can live at peace in their own country. I think as a country we’re now clearly decided on a two-state solution. At the time, we all began to talk about refugees going to a new Palestinian state and that Israel, like any country, would have control of its own immigration policy with the hope that it would be a fairly open and liberal one. And that there would be some swaps in terms of settlements. I think those principles laid down by President Clinton are, to a great extent, the best ones to guide policy in the future. WJD: Another situation the next president will inherit is in Darfur. It’s been nearly four years since President Bush called it a genocide, but the U.S. hasn’t really engaged. What are the options at this point? MA: It is obviously a tragic situation of watching what’s basically a rolling genocide, one that’s been going on a long time. I had a meeting in March where Jan Eliasson Lyeson, who was the former Swedish ambassador in the U.S. and foreign minister of Sweden and is now the secretary general’s envoy, [was] describing a circle of problems. One is obviously what’s going on in Khartoum and the difficulty of pressing the government. Another is to keep the Security Council and the U.N. together on it. A third was what to do with the fact [that] the rebel groups keep dividing amoeba-like so that it’s hard to figure out who should be at the table. And then the fact that some of the villages from which people in the refugee camps have come are now being occupied by other people. So the problems get worse, they don’t get better. WJD: At the beginning of the book, you note that whoever comes in to the White House does so ‘with respect for American leadership lower than it has been in the memory of any living person.’ What’s the single biggest thing the new president must do to start mending that image? MA: The single thing to start with, right off, is to close Guantanamo. Recently, five former secretaries of state met at a conference in Georgia – that means Henry Kissinger, [Warren] Christopher, [James] Baker, myself and Colin Powell – and all of us agreed closing Guantanamo is a good idea. In addition to that, there should be a very clear signal that the U.S. has rejoined the international system. Whether that is by opening talks with the International Criminal Court (ICC) or deciding that it’s a good idea to join or launch a new round of climate talks, something that would be a very visible sign of the opposite of what President Bush did, which was pull out of the Kyoto Protocol and pull out of the ICC. There have to be some immediate things and then laying out a set of priorities for the first term. Not everything can be solved right away. I see five huge umbrella issues the next president will have to deal with: fighting terrorism in a way that doesn’t create more terrorists; dealing with the broken nonproliferation system; restoring the good name of democracy; dealing with the negative aspects of globalization, primarily the gap between the rich and the poor; and then the climate change and energy issues. Just by listing them, it’s clear that they’re going to require a lot of international cooperation. So we need to provide a signal that shows we’re willing to cooperate internationally so we can expect other countries to do the same.